Hello everyone, and Happy Holidays! To those of you that celebrate Christmas, Happy Christmas! As (physical) book smugglers, we have long since learned to fully appreciate and love ebooks – and we want to share the love with you, dear readers! 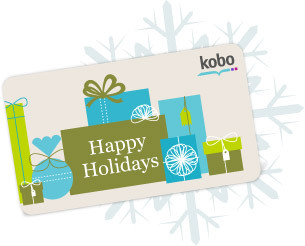 Kobo supports EPUB, has a number of international store locations, plus has a host of apps if you have a smartphone or tablet (which is why we’ve selected Kobo for this giveaway). The contest will run until Tuesday January 1, 2013 and is open to EVERYONE. in order to enter, use the form below and leave a comment letting us know what is YOUR favorite read of 2012!. Good luck, and Happy Holidays! “The Night Circus” by Erin Morgenstern, was the book I loved best this year. The Fault in Our Stars by John Green was my fav this year. Merry Christmas! Well, the Rafflecopter Gadget just says “Leave a comment”, and I don’t seem to be able to find where does it say we have to talk about our favourite book of 2012… But it’s a good question! Thanks for a great year of book discoveries, Smugglers, and for the Giveaway. My favorite book this year was Redshirts by John Scalzi. Not a YA-novel I know but such a funny read. My favorite read of the year was Divergent by Veronica Roth. But Ready Player One by Ernest Cline was a close second. 😉 Thanks so much for the generous giveaway and all the hard work that you do! Merry Christmas and Happy, Healthy 2013! My favourite non-fiction read was Let’s Pretend This Never Happened (A Mostly True Memoir) by Jenny Lawson. My favourite fiction read was probably The Fault in Our Stars by John Green. Its a difficult call to find my favorite book this year. I don’t even remember all of them on top of my head. Then there’s the rereads. I will pick “The Emperor’s Soul” by Brandon Sanderson, one of my all time favorite author. As before he had once again manage to surprise me with a superbly original backdrop & magic system in the cliche pron genre of Fantasy. My latest read was “Keeper of the Lost Cities” by Shannon Messenger, a fabulous find a debut author. Cannot wait to read the next installment of the series or her other upcoming series. And my most awaited book for the next year is probably the finale of “The Kingkiller Chronicle” by Patrick Rothfuss. Definitely Death in the Floating City by Tasha Alexander. ahh this is so tough. I’ll go with the Penderwicks series by Jeanne Birdsall for my favourite book(s). If I have to choose just one then it would be The Moonstone by Wilkie Collins – I think this is the first time ever that I choose a classic as my favourite of the year! Merry Christmas! If I have to choose just one… Code Name Verity! So good. Definitely the Fault in Our Stars. Code Name Verity, for sure! I had so many favourite reads this year, I’m not sure I could narrow it down to one! If I absolutely had to choose, it would have to be Crazy by Amy Reed. It made me cry so much. I finally read Baltasar and Blimunda by José Saramago, a beautiful, angry, and tender novel. The Blue Light Project by Tim Taylor and Holding Still for as Long as Possible by Zoe Whittall were very impressive surprises. It’s a hard pick, but I’ve got to say “Dodger” by Terry Pratchett. Code Name Verity was probably my favorite. There were a lot of good books this year, though. “Shine,” by Lauren Myracle. 🙂 Merry Christmas! I’m torn between Days of Blood and Starlight by Laini Taylor and The City Son by Tom Pollock. Gone Girl. Couldn’t put that book down. Favourite book of 2012 is Cast in Peril by Michelle Sagara. Great Series. Eleanor and Park was my favourite this year! One of my favorite books of the year was Miss Peregrine’s Home for Peculiar Children! 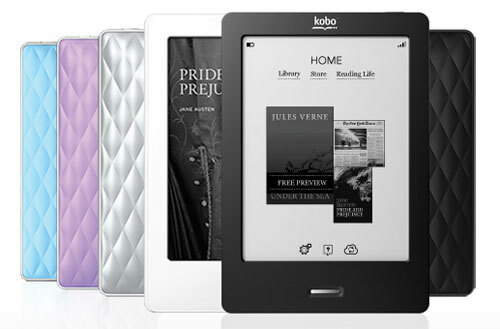 Unlimited ebooks!! I adore ebooks because I never run out of storage, unlike physical books. Great giveaway! My fave read was Cloud Atlas by David Mitchell. And then everything else he wrote! My favorite read this year has been Pamela Dean’s Tam Lin. Hmmm… I just finished Falling Kingdoms and it was awesome. I think my favorite 2012 read was the Hunger Games trilogy. My favorite read in 2012 was The Fault in Our Stars by John Green! So many great books to choose from – I loved Easy by Tammara Webber. Code Name Verity, probably, but with strong showings from Broken Harbour, Three Parts Dead, Days of Blood and Starlight and The Lost Girl. It’s hard to pick one but my favourites this year were probably Tove Jansson’s The True Deceiver and Steve Kluger’s Almost Like Being in Love! I loved Gone Girl! It just sucked me right in. Difficult to choose, but I’ll go with Susanna Kearsley’s Mariana. I glommed her backlist this year, and there wasn’t one I didn’t enjoy! I loved Jo Knowles’ See You at Harry’s. Hard to pick just one, but I’ll go with A Perfect Storm by Lori Foster. I always enjoy her stories. A draw between Genevieve Valentine’s Mechanique and Karen Lord’s Redemption in Indigo. My favorite read this year was Gone Girl. I don’t think I have one favourite, I read a LOT this year. So I’ll go with a recent read, Hood by Stephen Lawhead. The Fault in Our Stars has probably stuck with me the longest. Favorite read(s) of 2012: A.S. King’s Ask the passengers, John Green’s The fault in our starts, Adam Rapp’s The Children and the wolves and Mal Peet’s Life: An Exploded Diagram. Not counting rereads of old favorites, I discovered ‘The Last Stormlord’ by Glenda Larke this year, and loved it. My favorite read was Mountains Beyond Mountains by Tracy Kidder, a biography of Paul Farmer who founded Partners in Health, one of my favorite charities and who is just an amazing individual. Favorite fiction was probably Into the Beautiful North by Luis Alberto Urrea. The Racketeer, by John Grisham was my favorite page turner. I am currently reading “Name of the Wind.” (I am a year behind on reading due to being out of the county last year). I have already shared it with family and have been passed in reading. I think it would have to be ICED by K.M. Moning. I can never get enough of the Fever World. What an amazing giveaway, thank you! I’ve read so many good books this year, but I think my favourite was probably Every Day by David Levithan, followed extremely closely by Son by Lois Lowry and Days of Blood and Starlight by Laini Taylor. My favourite 2012 read is Forbidden by Kelley Armstrong. I would have to say it was Fair Game by Patricia Briggs. My favorite read of 2012 hands down was Code Name Verity! My favorite read of 2012 is The Water Room by Christopher Fowler. My favorite read this year was Tana French’s Broken Harbor! The first book that came to mind was The Fault in Our Stars by John Green. I read it while a friend was dying of cancer, so it hit extra hard, but in a good way. My favorite this year was Catherynne M. Valente and her two Fairyland books. I read both in 2012 and actually liked the second one better. Definitely my discovery of the year! My favoutie read of 2012 was Wool by Hugh C. Howey (the first book in the series). I am working my way through the rest of the series now, what a treat it is! My favourite read of this year was probably Shadows on the Moon by Zoe Marriott. Code Name Verity by Elizabeth Wein, The Age of Miracles by Karen Thompson Walker were two of my top reads this year. My favorite book this year was “Nightshifted” from Cassie Alexander. The best book I read this year was Amor Towles’ Rules of Civility. A two girls and a guys story that breaks the mold when the heroine, the narrator, finds her place in New York’s social strata in the late 1930s. The authors does a great job at capturing the ease it is to move between social positions–or rather its seemingly randomness. The heroine is also someone worth rooting for with her love of books, her sense of inner calm and her ability to take on the craziness that occurs around her. This book also begins and ends on New Year’s Eve, so it’s appropriate for this time of year. I Am The Messenger by Marcus Zusak. It’s hard to pick just one, but three of my favorites I’ve read this year are, The Fault in Our Stars, The Edge of Never & You Against Me! Code Name Verity by Elizabeth Wein. Best thing I read this year, no contest! I had 4 top reads in 2012 but I’d say the best was Easy by Tammara Webber. My favorite book this year was Angelmaker by Nick Harkaway. My favorite is a toss up between Miranda Neville’s Confessions from an Arranged Marriage and Carolyn Jewel’s Not Proper Enough. This year I was riveted by Insurgent! there were so many great releases though and I will reread them again and again! That is a tough question! But I would say it’s a tie between “The Fault in our Stars” and “Easy”. It’s a tough one, but I’ll have to say either “Unspoken” by Sarah Rees Brennan or Speechless by Hannah Harrington – both because they allowed me to get away from my own life and its troubles and let me focus on something else, something which I’ve sorely needed this year. Mine was a re-read of Harry Potter. That’s a tough one…I’d say, either Code Name Verity or Liar and Spy. My favourite read was Russian fantasy: Vera Kamsha “The flame of Eterna” (plamia eterny). Sadly not translated into English. Great world-building and fascinating characters. From the English books, I would say the entire Mercy Thompson series by Patricia Briggs who I discovered this year. fifty shades trilogy was my fave 2012 read! “The Woman Who Died A Lot” by Jasper Ffforde. He always manages to surprise me. My favorite read of the year would be a toss up between Seraphina and Captain Vorpatril’s Alliance. Thanks for the awesome giveaway! I’d have to say that I had a lot of favs this year. So It’s not “the” fav but one of, and that was the Witness by Nora Roberts. My favorite book that I read this year was the Hunger Games. Loved it! My favorite read of the year is Unspoken by Sarah Rees Brennan. The heroines are amazing and I’m always gratified to see that they don’t need the men in the story to rescue them – in fact, in this story, they’re the ones rescuing the guys. There was so many good ones… a monster calls made me cry so I’m going with that one!!! Hard to choose just one. One would have to be The Twelve by justin cronin. Very difficult to choose ONE favorite read, but my favorite read of 2012 was THE ISLAND HOUSE by Posie Graeme Evans. I read a lot of great books this year, but I have to say Code Name: Verity takes the cake. I was a sobbing mess by the end and was sad into the next day – only truly wonderful books make me feel that many feelings. It’s hard to pick one favorite out of this year’s 151 books, so I’m going to cheat and pick three. Most obviously, Jim Butcher’s Cold Days. Middle of the road, Geekomancy by Michael Underwood. Finally, out of left field, Ken Harmon’s twisted The Fat Man: A Tale of North Pole Noir. My favorite read of 2012 is The Girl Who Fell Beneath Fairyland and Led the Revels There. My favorite read this year was In Too Deep by Jayne Ann Krentz. But if I hear another book title that may be my favorite. There are so many good books out there. My favorite was The Fault in Our Stars by John Green. Thanks for the giveaway! I’ve had a busy year, so most of my reads came in this month. My favourite was Kristin Cashore’s Bitterblue, despite what it did to my poor heart. Hmm, I read so many good books this year. I guess I’ll say The Raven Boys by Maggie Stiefvater. Thanks for the giveaway! Happy Holidays!! Hmm…sadly, I don’t really have a favorite book of 2012. None of the books I read this year (which admittedly wasn’t all that many) blew me away; they were all just “ok”. My favorite was BORN WICKED by Jessica Spotswood. I read so many books, it’s hard to narrow it down. I really loved Obsidian by Jennifer Armentrout. Too many choices… I loved “A Posse of Princesses” by Sherwood Smith, “How to Write Science Fiction and Fantasy” by Orson Scott Card, and “The Winter Prince” by Elizabeth Wein. But they’re so different from each other that it’s impossible to decide. Tough to choose just one. If pressed, I will say THE RAVEN BOYS. If pressed. A toss-up between two Korean web comics for me: “Tower of God” by Slave in Utero, and “Kubera” by Currygom. Asha from “Kubera” is by far my favourite character of the year: powerful, stoic female mage on quest for revenge and I just SO want her to somehow come out of this happy and I know it isn’t going to happen and…GAH! Depends on the moment and mood. I really liked “The Serpent Sea” by Martha Wells, “The Silvered” by Tanya Huff, “My Loving Vigil Keeping” by Carla Kelly. I discovered John Green and loved the character Tiny Cooper from “Will Grayson, Will Grayson”, which Green co-authored. Also discovered three very good ebook authors – Lindsay Buroker, Sabrina Chase and Andrea Host. And then of course there was the Ivan book. A good year for reading. The song of Achilles was pretty mind-blowing for me. It’s a tie between THE FAULT IN OUR STARS and CODE NAME VERITY. I can’t choose just one! My favourite read of the year was the Hour Game by David Baldacci. I really enjoyed A Discovery of Witches. I would have to say Unraveled by Courtney Milan. My best read for the year 2012 would have to be Ready Player One. It was an amazing read. About my favourite book of 2012 – I’ll say Pandemonium by Lauren Oliver – it was beautifully written and absolutely epic. My favourite non-fiction book of the year was How to Supress Women’s Writing, hands down. It was eye-opening – even so long after it was published, which is a bit disheartening – and I want to use it as a reading list so my knowledge of classic women authors goes up a little. My favourite fiction title is harder to pick, but I think I’m going to say that Wandering Son (two japanese children experimenting with their gender identity, handled in a really respectful and honest way for the most part.) was my favourite manga, and A Monster Calls (When the monster turns up, he’s disappointed. It wasn’t the one he was expecting) was the best novel. Unearthly or Crewel or Under The Never Sky. I discovered and loved all three of those books. The one that stands out to me is Unspoken by Sarah Rees Brennan, although this was a spectacular year for new books. My favorite read of this year would have the be the False Prince. Lots of good reads in 2012, but my top one is still CODE NAME VERITY by Elizabeth Wein. For 2012 pub. date, The Dirty Streets of Heaven by Tad Williams. My favourite is Twenty Boy Summer by Sarah Ockler. It wasn’t published this year but I only read it this year, so..
Hmm… like others have said, I wasn’t too blown away this year, especially by the debuts. But I did enjoy Bitterblue! I really enjoyed the Russian inspired fantasy Shadow and Bone by Leigh Bardugo and the cyborg Cinderella story Cinder by Marissa Meyer. I also really loved Flame of Sevenwaters by one of my long time favorite authors, Juliet Marillier. I would LOVE to win either of these gifts. I love reading. My favorite read of 2012 was an oldie…Mitch Albom’s “Tuesdays with Morrie”. Oh how I cried!! What a beautiful story! My favourite read was Orlando by Virginia Woolf. God’s War by Kameron Hurley is second best. i really liked cinder and shadow and bone. thanks for the giveaway! My favourite read was Easy by Tammara Webber. The best book of the year is a tie for me, Empire State by Adam Christopher and Mockingbird by Chuck Wendig. Both are awesome Angry Robot books. This is so hard! I would have to say…Throne of Glass by Sarah J. Maas! I have a tie. I loved Iced by Karen Marie Moning and The Siren by Tiffany Reisz. They were both books I just couldn’t put down. “Shadowfell” by Juliet Marillier. Thanks for the give-a-way! Reflected in You by Sylvia Day. Soo good! Favorite read was Princess of the Midnight Ball. My favorite read of 2012 was Address Unknown by Katherine Kressman Taylor. But I loved a bunch of books this year. Eeks I’m so glad I just wrote a post on my top 10 favorite reads of 2012, so that I could actually decide what to put. Definitely 100% “The Geography of Bliss” By Eric Weiner. It’s beautiful and fun and helped me figure out that a country can be your home (even if you were never born there and have never been). 😀 Hope I win the E-Reader! So hard to pick one! But I have to say, Code Name Verity stuck with me in a way few books ever have. Also I enjoyed the fact it wasn’t an “easy” read, and took some effort to get into, but that it paid you in full for your perseverance. The first titles to spring to mind when I re-read this post today were Ann Aguirre’s Endgame, and Mira Grant’s Deadline. But really, I don’t have a singular favorite – I loved too many books this year! Only one??? How about four? Mr Penumbra’s 24 Hour Bookstore! I don’t know if it’s the best book all year, but I just finished Ghost Song by Sarah Rayne and I loved every thing about it. And it fits a musical theme with Seraphina, which I also recently finished and loved. The Target by Alain Robbe-Grillet and Jasper Johns. Surreal story relating to the art in a show? Things that have the feel of deep symbolism and nonsense at the same time? Tons of imagery? A gorgeous translation and COLOUR PLATES?! Yes, please! I discovered the books by Kevin Hearne about Atticus O’sullivan. I loved Hounded. My favorite book of 2012 was Code Name Verity! Leave a comment letting us know what is YOUR favorite read of 2012! my favorite read for 2012 was the entire Game of Thrones series by George R. R. Martin. Game of Thrones series by George R. R. Martin. I haven’t read a whole book this year. I just browse thru the net for infos and stuff. Hope to have this and get into reading again! Favorite read for this year would be Hunger Games! I also love the movie! I can’t weigh the two. John Green’s The Fault in Our Stars and Haruki Murakami’s Norwegian Wood. They’re both good, in some levels. But I guess I’ll have to go with The Fault in Our Stars. It changed the way I view life. Man, I am lucky. We all are. The Alchemyst: Secrets of the Immortal Nicholas Flamel and the 5 books that followed. Fifty shades darker – the 2nd in the series was the best imho…. DIVERGENT. I read it after my son and loved it! I’d say my favorite read of 2012 has to be Bitterblue, by Kristin Cashore. It was thought-provoking, disturbing, and entirely wonderful and magical all at once. Bitterblue by Kristin Cashore definitely, with Tempest Rising by Nicole Peeler close behind. I really loved the very-serious-tone that Bitterblue had but the Jane True series is just tons of fun. I just read Daughter of Smoke and Bone and think it might be my favourite book ever! Have also loved The Fault in our Stars and Mira Grant’s Newsflwsh swriea this year. My favourite read this year is Beautiful disaster by Jamie Mcguire. my favorite read was the Hunger Games! I have a tie between Speaks the Nightbird by Robert McCammon and The Art of Fielding by Chad Harbach. Thanks! I think my favourite has to be Ordinary Magic, by Kaitlyn Rabino-Bradley. (Misspelled that, I’m sure.) The characters were brilliant, the plot was lovely, and it managed to have clear right and wrong without devolving to Black and White, which is hard in a MG book. I loved it. My favorite is Bitterblue by Kristin Cashore! Just one? You’re kidding, right? Um, tie between The Freedom Maze by Delia Sherman and When You Reach Me by Rebecca Stead. Angelmaker by Nick Harkaway was my favorite book published in 2012 and The Night Circus by Erin Morgenstern was my favorite read in 2012.
well of course this is a very difficult choice… i hate picking favorites, like so many of you. i’ll choose “the 10 pm question” for the sake of picking a single favorite — but i must say, it was quite a year for amazing books! 50 Shades of Grey by far!! Oh gosh, so many good reads. But “Divergent” is topping my list right now. My fav. read of 2012 is Undercover Affair by Lilian Peake. my fave read of 2012 is hunger games! Just started 50 shades and really into it. Patricia Cornwell- The Bone Bed! My favorite was A Good American by Alex George. I just started the Tapestry series. So far, sooo good! My favorite read is Undercover Affair by Lilian Peake. The book I like better is The Shadow of the Wind. And I must thank you to incitate me to read it. But if I had to pick a book released in 2012, it would probably be Ruins or Cinder. Sadly, the rafflecopter application said the contest is already over.